What is the single greatest goal-scoring season in NHL history? Is it Wayne Gretzky's record 92 goals in 1982? What about Brett Hull's 86 in 1991? Or Mario Lemieux's miraculous 69 in 60 during the Golden Year of 1993? All three are worthy contenders, as are the likes of Mike Bossy, Phil Esposito, Cam Neely, Maurice Richard, and Teemu Selanne. And even though they never cracked 50, Bobby Orr and Paul Coffey deserve consideration. However, for my money, the most remarkable individual goal-scoring season in NHL history belongs to a Florida Panther. 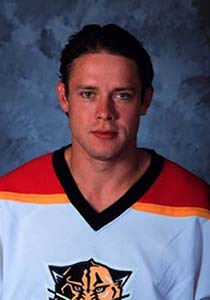 Florida, famous for dead rats and moribund offenses, witnessed the single greatest goal-scoring performance ever when Pavel Bure blitzed the league for 59 in 2001. While usually remembered for his glory days with the Vancouver Canucks, Bure spent parts of four seasons with the Cats, recording two 50-goal campaigns and totaling 152 goals in 223 contests. His Sunshine State exploits should be celebrated. Start pouring. Bure made his NHL debut with the Canucks on November 5, 1991, striking like a bolt from heaven and wrecking defenses with his breathtaking speed and creativity. Despite dazzling most every shift, his career actually got off to a slow start. He produced just four goals and an assist in his first 13 contests, and he had a mere six goals and 12 points after 27 games. But the young Russian winger eventually found his touch, ringing up 22 goals and 32 points over the season's final 23 games. Even though he missed the start of his rookie season due to legal squabbles with the Soviet Ice Hockey Federation, Bure still led the Canucks with 34 goals, three more than team captain Trevor Linden. Over his seven seasons in Vancouver, Bure recorded 254 goals and averaged 0.59 goals per contest. He authored seasons of 60, 60, and 51, joining Wayne Gretzky, Mario Lemieux, Brett Hull, Phil Esposito, Mike Bossy, Jari Kurri, and Steve Yzerman as the only players to ever record multiple 60-goal seasons. Bure retired with 437 goals in 702 games, his career 0.623 goals-per-game average ranking behind only Bossy (0.762) and Lemieux (0.754). Bure flew solo in Florida. When he scored 59 goals and 92 points in 2001, Bure's next highest-scoring teammate was Viktor Kozlov, who checked in with 14 goals and 37 points. Kick that one around the ol� gulliver a moment. Bure had 45 more goals than his closest teammate. The next four Panthers -- Kozlov (14), Mike Sillinger (13), Marcus Nilson (12), and Rob Niedermayer (12) -- had 51 goals combined. In fairness, Kozlov played only 51 games. But even if you project his per-game averages over 82, he still would have ended with approximately 23 goals and 60 points. Hardly All-Star numbers. Sillinger and Ray Whitney also could have flirted with 20 had they not been traded; both projected to 19 goals. Then again, Sillinger went to Ottawa and finished with 16 total, and an injured Whitney failed to find the net in his three late-season appearances with the Blue Jackets. But they were traded. Kozlov was injured. No 20-goal scorers. Bure's 59 goals accounted for 29.5% of the team's total (200), far and away the highest percentage in modern NHL history. One has to venture back to the days of Joe �Phantom� Malone and Newsy Lalonde to find superior percentages. To put Bure�s number in perspective, Gretzky's 92 goals accounted for 22.1% of Edmonton's 1982 total (417), and that was the only time in Gretzky's entire career he scored more than 20% of his team's goals. Bure led the NHL with 384 shots in 2001; Nilson was second on the club with 141. Bure also played 26:52 per game, the most ever credited to a forward since the NHL began keeping ice time as an official stat. On March 7, 2001, he logged an astounding 40:12 in a 3-3 tie with the Sharks, scoring one goal on eight shots. Bure's heroics couldn't carry the Panthers to more than 22 wins, and the club missed the playoffs by a country mile. Playing on lousy teams has few benefits, and Bure certainly didn't feast during lopsided losses. He tallied 40 of his 59 when the score was tied or within one goal either way, and he netted only three when the Panthers trailed by three or more goals. Bure's 2001 showing takes on Herculean proportions when one compares the 2001 Panthers to the supporting casts of the league's other legendary seasons. When Gretzky rewrote the record books in 1982, Mark Messier scored 50 goals. Glenn Anderson (38), Jari Kurri (32), and Dave Lumley (32) went over 30. The Oil had three additional 20-goal scorers, including Paul Coffey who bagged 29. Granted, Gretzky elevated his supporting cast, but his supporting cast happened to include four Hall of Famers. Even the Great One wouldn't have been able to lift Florida's dead weight. With all due respect to Phil Esposito, Gretzky was the most insulated scorer in NHL history. He had nine career 50-goal seasons, and during those years he averaged 5.78 teammates with 20 goals. In five of the nine seasons, Gretzky had at least six 20-goal mates, topping out at seven in 1982, 1983, and 1984. Also, please remember Gretzky did most of his damage in the post-expansion era from 1981 to 1986, which happened to be six of the seven highest-scoring seasons in NHL history. As a general rule of thumb, reduce all early 1980s numbers by one-third to understand them in a modern context. The league averaged an ungodly 8.03 goals per game in 1982, making it the second-highest scoring season in history (1944, 8.17). By 2001, that average had fallen to 5.51 goals per game. Place his totals in 1982 terms, and Bure's 59 goals would equate to 76 over 80 games. Meanwhile, Kozlov's 14 goals would bump to 18. The 82 Oilers equivalent would be Gretzky followed immediately in scoring by Dave Hunter, Brett Callighen, and Dave Semenko. Mario Lemieux's 1993 season should be revered for more than just the 69 goals in 60 games. Rob Niedermayer and crew are awful, but they're not cancer bad. What Lemieux accomplished that season should be in a separate category far from mortal men. Yet any comparisons between the 1993 Penguins and the 2001 Panthers are laughable. Even without Lemieux for 24 games, the Penguins ran away with the President's Trophy, collecting 56 wins and 119 points in quest for a third consecutive Stanley Cup. Kevin Stevens (55), Rick Tocchet (48), Jaromir Jagr (34), and Joey Mullen (33) combined for 170 goals, or 29 more than all 2001 Panthers not named Bure. The Pens also got 20-goal seasons from Shawn McEachern (28), Ron Francis (24), and Larry Murphy (22). This was easily the best supporting cast of Lemieux's career in terms of top-end scoring talent, although the third and fourth lines were nonexistent. Like Gretzky, Lemieux could turn even average players into consistent goal-scorers, so his playmaking created the illusion of support where none existed. Stiffs like Warren Young, Dan Quinn, and Rob Brown all posted 40-goal seasons skating with Lemieux. Randy Cunneyworth -- yes, that Randy Cunneyworth -- scored 35. Lemieux's greatness prevented him from ever matching Bure's solitary scoring dominance, because he made everyone around him a goal-scorer. Lemieux's career-high in goals came in 1989 when he clocked 85 playing with Paul Coffey and little else. But even then, Lemieux's production accounted for just 24.5% of the team's overall total. And once the 1990s rolled around, Lemieux had stacked supporting casts on par with what Gretzky enjoyed during the early 1980s. Brett Hull's 86 goals in 1991 lapped his nearest St. Louis teammate by a record 59 tallies. Geoff Courtnall ranked second that year with 27, joining Adam Oates (25) as the team's only other 20-goal scorers. One of the game's premier playmaking centers, Oates collected 90 assists next to Hull. There is no 86-goal season without Oates. And as limited as they were, the 91 Blues still provided Hull six other players with at least 14 goals or 37 points, meaning Hull's 86 goals were only 27.7% of the team's overall total (310). Hull notched 72 goals in 1990, but he had a much stronger supporting cast, with Paul MacLean chipping in 34 goals and four other Blues eclipsing 20. Hull's scoring binge continued in 1992 with another 70-goal effort, and this time Brendan Shanahan rode shotgun with 33 goals while Nelson Emerson (23), Jeff Brown (20), and Dave Christian (20) all hit 20. Hull's five-year string of dominance concluded with 54 goals in 1993 and 57 in 1994. Shanahan kept pace both times, scoring 51 and 54, respectively. His boy may have surpassed him in career goals, but Bobby Hull remains the best left winger who ever lived. Hull the Elder was the first man to post multiple 50-goal seasons, turning the trick five times over an 11-year span. Chicago provided him with 4.60 20-goal scorers, including another all-timer in Stan Mikita. When Hull buried a career-high 58 goals in 1969, the Blackhawks had four other 30-goal scorers plus a pair of 20s. His most remarkable performance actually occurred during his initial 50-goal campaign of 1962. Hull struck 50 on the nose that year to account for 23.0% of the club's offense, while Mikita (25) and Ab McDonald (22) were Chicago's only other 20-goal scorers. Aside from being the reigning career goals-per-game king, Mike Bossy shares the title for most 50-goal seasons with Gretzky (9) and holds the mark for most consecutive 50-goal campaigns (9). Of course, Bossy only wears the goals-per-game crown because Lemieux limped around the ice until the age of 40 to save the Pittsburgh franchise, and Bossy also benefitted greatly by playing almost his entire career on stacked teams in the inflated post-expansion era. Regardless, his personal achievements are staggering. Yet Bossy never approached Bure's level of individual dominance. Bossy always had Bryan Trottier in the middle to help shoulder the load. And even when Trottier missed time, Bossy forged a terrific trio with Brent Sutter and John Tonelli. In six of his nine 50-goal seasons, Bossy had at least one 40-goal teammate. He always had at least three 20-goal teammates and had as many as seven on three different occasions. All told, the Islanders averaged 5.56 20-goal scorers in each of Bossy's 50-goal efforts. The Isles were so loaded that Bossy never once scored more than 20% of the team's goals, falling just shy in 1983 when his 60 goals represented 19.9%. Before Gretzky came along, Phil Esposito owned all the goal-scoring records. His 76 in 1971 made him the first man to break 60 and began a string of five consecutive 50-goal seasons. Those Boston squads of the early 1970s are on the short list of greatest teams ever assembled. Esposito averaged 7.00 20-goal teammates during the stretch, had as many as nine 20-goal mates in 1971, and shared the spotlight with fellow 50-goal men Johnny Bucyk and Ken Hodge. There was also this guy Orr who was pretty, pretty good. Bobby Orr and Paul Coffey are the only two defensemen to ever threaten 50 goals. Orr went for 46 in 1975. Coffey hung 40 in 1984 and a record 48 in 1986. Obviously, scoring 40 from the blue line is spectacular, but each man was a single weapon amongst fearsome arsenals. When he recorded his career-high 46, Orr still finished 16 goals behind Esposito and had a total of six teammates with 20 goals. His 46 tallies represented 13.3% of Boston's 345 team goals. Coffey's 48 accounted for 11.3% of Edmonton's 426 goals, and he had three 50-goal scorers ahead of him in Kurri (68), Anderson (54), and Gretzky (52). Alexander Ovechkin and Steven Stamkos deserve mention in any goal-scoring discussion. Ovechkin has topped 50 goals four times, and his career-high 65 in 2008 represented 26.9% of Washington's offense. Skating with two-time scoring champ Martin St. Louis, Stamkos has two 50-goal seasons, including a 60-goal bid in 2012 that equaled 25.5% of Tampa Bay's goal output. And don't overlook what Jarome Iginla accomplished in pre-lockout Calgary. Iggy rifled home 52 goals in 2002, good for 25.9% of his team's offense. All impressive feats to be sure, but none of them touch 01 Bure. Maurice "Rocket" Richard had nothing on the Russian Rocket. In terms of individual dominance, Richard's historic 50-goal 1945 season falls far short of Bure's 2001 performance. The Habs boasted four other 20-goal scorers during the 50-game slate, including Richard's linemates Elmer Lach (26) and Toe Blake (29). Lach led the league in assists (54) and points (80), finishing seven points ahead of Rocket. Thanks to the excellent support, Richard's 50 goals were a mere 21.9% of the team's offense. And don't forget, World War II drained the talent pool during the mid-1940s, making it the second-easiest era in which to score goals behind only Gretzky's early 80s heyday. Richard's 50 in 50 actually sits fourth amongst his most dominant seasons. His 45 goals in 1947 accounted for 23.8% of the team total. In 1951, he scored 42 goals to represent 24.3% of Montreal's offense. And in 1950, Richard notched 43 without another 20-goal scorer on the roster to provide 24.9% of the team's 173 markers. In 1994, a hobbled Cam Neely scored 50 goals in 49 outings, never losing his scoring touch despite rarely playing consecutive games. Like Brett Hull and another fella who will be mentioned later, Neely benefitted from the great Adam Oates, who posted 32 goals and 80 assists. The 94 Bruins also boasted three other 20-goal scorers in Bryan Smolinski (31), Ted Donato (22), and Ray Bourque (20), limiting Neely's 50 goals to 17.3% of the team's offense. Of his three 50-goal seasons, Neely's most dominant effort came in 1990 when his 55 goals accounted for 19.0% of Boston's total (289). Due in part to playing 70-game seasons, Gordie Howe never scored 50 goals. He went north of 40 five times, blasting a career-high 49 in 1953. Howe always enjoyed solid supporting casts featuring Ted Lindsay, Sid Abel, Alex Delvecchio, and Frank Mahovlich. With Detroit's scoring spread out, Howe never accounted for more than 22.2% of his team's goals. Charlie Conacher was the NHL's most fearsome shooter during the 1930s, taking the goal title five times in six years. In 1931, Conacher hammered 31 goals in 37 games. But with the likes of Busher Jackson, Joe Primeau, and Ace Bailey providing cover, Conacher's production went no higher than 26.3% of Toronto's goal total. Most every other great scorer throughout history had at least one legendary running mate, if not more. Guy Lafleur had Steve Shutt. Marcel Dionne had Charlie Simmer and Dave Taylor. Michel Goulet had Peter Stastny. Alexander Mogilny had Pat LaFontaine. Again, Bure scored 59 without another 20-goal scorer on the roster. Through 2013, the NHL has seen 191 50-goal seasons, and only three other men can match Bure's claim. For pure entertainment value, Teemu Selanne's 1992-93 rookie campaign may take the vegan, gluten-free cake. The Finnish Flash made each game an event, barnstorming his way to 76 goals. But he wasn't alone. Even though Selanne had 48 more goals than his nearest teammate, that Winnipeg club had five 20-goal scorers and a 97-point man in Phil Housley. The Jets had eight other players with at least 14 goals and seven players with 37 or more points. No, Selanne's truly spectacular season came years later, far from the wintry wonderland of Manitoba. By the late 1990s, Selanne had soared to Anaheim and forged an uncanny chemistry with Mighty Duckling Paul Kariya. The duo had combined for 97 goals in 1997, their first full season together, and had big plans for an encore. But a Gary Suter crosscheck to Kariya's jaw changed all that. The resulting concussion limited Kariya to 22 games in 1998 and forced Selanne to go it alone. Without his plucky sidekick, Selanne still managed 52 goals in 73 games. Incredibly, Kariya tied Steve Rucchin for second on the team in goals with 17. Scott Young, who had 13 tallies, was the only other Duck to reach double-digits. Technically, like Bure, Selanne did not have another 20-goal scorer on his roster. And Rucchin's 53 points made him the only other Duck with at least 37 points, although Dmitri Mironov fell just shy with 36. Still, it's difficult overlooking Kariya's presence, especially since he had 17 goals and 31 points in his 22 games. Oddly enough, Selanne actually scored at a better clip when Kariya was out of the lineup. In his 22 games with Kariya, Selanne scored 15 goals, averaging 0.681 goals per game. In his 51 games without Kariya, Selanne scored 37 times, averaging 0.725 goals per contest. The 98 Ducks were just as dreadful as the 01 Panthers, mustering 65 points and a whopping 205 goals scored. Selanne's 52 red lights marked 25.4% of the team total. Close. But not quite. Kariya had been all by his lonesome in Anaheim until Selanne arrived towards the end of the 1996 season. The tandem clicked immediately, sparking Kariya to the lone 50-goal season of his career. Rucchin was second in scoring with 19 goals and 44 points. Selanne's 16 goals and 36 points in 28 games ranked third. Yes, technically, Kariya matched Bure in scoring 50 without a 20-goal teammate, and he had only one teammate above 37 points. But Todd Krygier and Mike Sillinger had 37 and 34 points, respectively, and would have surpassed Kozlov's 37-point benchmark had they not been traded. And of course having Selanne around for 28 was a huge advantage over Bure. With Selanne in the lineup, Kariya scored 20 goals and 42 points, good for 0.714 goals per contest. Considering he had been averaging 0.536 goals per game prior to Selanne, Kariya likely doesn't hit 50 without him. Cut from the same cloth as Bure, Peter Bondra possessed blazing speed and a howitzer off the wing, stockpiling 503 goals in 1081 career games. Bondra had nine 30-goal seasons, maxed out at 52 twice, and led the league in goals twice, the first coming in the lockout-shortened 1995 campaign when he pitched a Cy Young-worthy 34 goals and nine assists in 47 contests. Bondra's first 52-goal effort came in 1996. Steve Konowalchuk was second on the Capitals with 23 goals, but Keith Jones (18), Pat Peake (17), Michael Pivonka (16), and Sergei Gonchar (15) beat Kozlov's 14-goal standard. Six other Caps conquered Kozlov's 37 points. Pivonka even edged Bondra in scoring, 81-80. Bondra's legit challenge to Bure came two years later in 1998. The Slovakian sniper again finished with 52 goals, tying Selanne for the league lead. And this time, Washington didn't have another 20-goal scorer on its roster. Adam Oates (18), Richard Zednik (17), and Calle Johansson (15) were the only Caps to post more than 14 goals. Oates was the only other skater to exceed 37 points, but his 76 were just two less than Bondra. Having Oates ends all Bure comparisons. And the 98 Capitals were also a decent team, finishing the regular season with 92 points and making a surprising run to the Stanley Cup Finals. In the end, 96 Kariya, 98 Bondra, and 98 Selanne are the only three goal-scoring seasons even remotely close to what Bure accomplished in 2001, and they all held significant advantages in supporting casts. No goal-scorer in NHL history did more with less than Pavel Bure. During his 12-year career, he never once skated a full season with a 40-goal scorer or a 90-point man. And in a lifetime of individual brilliance, Bure's 2001 season stands alone, a towering triumph for the ages.